There are two common reactions to seeing snow falling outside the window. It’s time to go outside and play / shovel / prune some Ambrosia apple trees (okay, maybe that’s just us). It’s time to snuggle up beside the fire with a hot, steaming mug. Both have their merits, but there’s no denying the comfort found with two hands wrapped around a warm cup. Especially when there’s something incredibly delicious inside. Forget tea, or coffee or even hot chocolate – we’ve got the perfect thing to fill that mug. 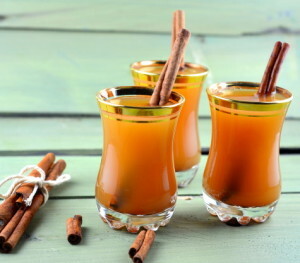 Spicy Ambrosia apple cider. Don’t confuse this with the apple cider vinegar we wrote about a few months ago. This elixir is much sweeter but it’s healthy too. The apple juice is good for your heart and immune system while the spices in this concoction aid digestion and help lower blood pressure. It’s a simple recipe, so snuggle-up time is only 10 minutes away. This recipe serves 2 – 3. We’re using whole and fresh spices but you can replace them with dried spices if you don’t have fresh. Put apple juice in a small sauce pan and bring it to a low simmer. Be careful not to let it boil. Add all spices into the pan and continue to simmer for a few minutes. The longer it simmers, the more intense the spice flavours. Remove from heat and add the juice from 1/2 a lemon. Strain into mugs. Garnish with a cinnamon stick and a fresh slice of Ambrosia apple. Serve next to the fire with an extra fluffy blanket and a good book.